SAN FRANCISCO — Yasiel Puig is anything but shy. The Los Angeles Dodgers rookie is happy to regale teammate Juan Uribe and Spanish-language broadcaster Jaime Jarrin with stories about his days in Cuba, as he did before a game against the San Francisco Giants last weekend. He'll crack up his English teacher and confidant Tim Bravo with jokes, funny faces and moments of wonderment, like his delight at discovering the multiple colors and flavors of Gatorade available when he first got to Dodger Stadium. "He's not quiet. He's pretty outgoing," manager Don Mattingly said. What he won't do is share with the American public those poignant, human moments of his remarkable journey from Cuban defector to the most talked-about figure in the major leagues today. 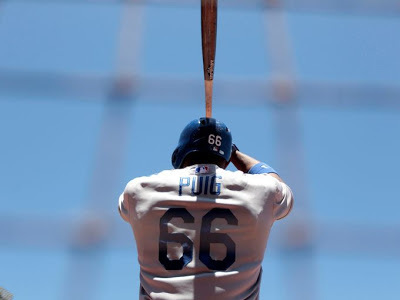 After he was named one of the five Final Vote candidates for the National League All-Star team Saturday — a day he finally showed offensive vulnerability by going 0-for-4 with four strikeouts — Puig declined to talk to news reporters. It continued a pattern of shunning media requests and refusing to talk to reporters before games. 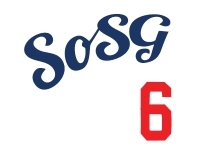 Puig, 22, was flooded with media demands while becoming the first rookie to be named player of the month in his first month in the majors, banging out 44 hits in June for the second-most prolific debut in history after Joe DiMaggio's 48 hits in May 1936. Knowing Puig's profile only figures to grow, the Dodgers intervened Sunday. After a morning meeting with general manager Ned Colletti and Jarrin, Puig committed to making himself available after games. And after his leadoff single in the ninth inning sparked a go-ahead, three-run rally in a 4-1 win against the Giants, Puig relented and fielded questions — though not until after a heated exchange with Uribe, who prodded him to cooperate. As Puig gets voted into the All-Star Game, I'm sure the spotlight is going to be even brighter. I'm glad Uribe is protecting Puig by blocking some media access. Call me crazy, but I think Uribe has some attributes which make him very "fit" for this role. Fit. I see what you did there. Dodger are glad that Uribe is a round. Does anyone know how many times you can enter a Puig Final Vote under one account? I know that Mr F was asking this yesterday. It looks like there isn't a limit to the amount of votes you can cast. I know I voted more than 25 times yesterday. Plan on voting more today. @Orel: given I wrote four sentences total for this post, I'm glad one of them worked!